Sunset on Lough Bane; the border separating Counties Meath and Westmeath runs east-west through the middle of the lake which is reputed to have the clearest water in Ireland. This year Dublin’s foremost Georgian space, Merrion Square, marks the 250th anniversary of its creation. 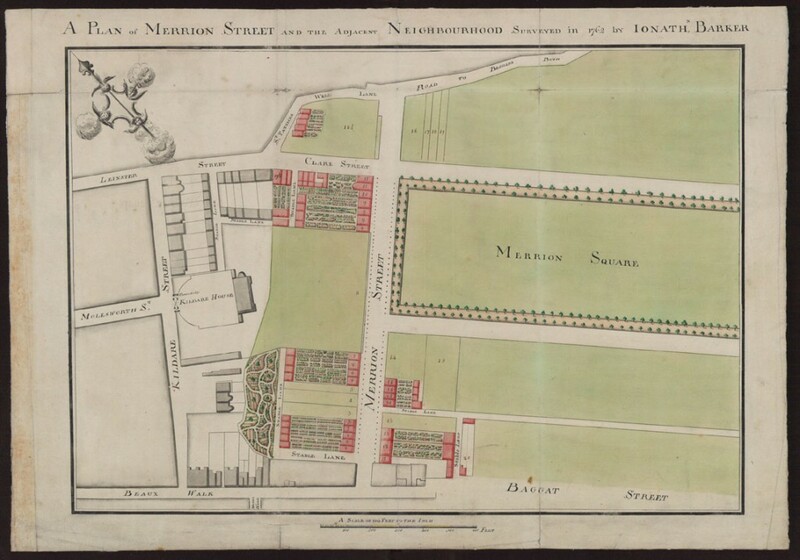 Actually that’s not altogether true: as early as 1752 there are references in the rent rolls of Viscount Fitzwilliam of Merrion to his landholding in this area being called ‘Merryon Sq.’ However the square only assumed its present form a decade later when Lord Fitzwilliam laid out the large central space. In March 1762 the estate leased five plots on the western end of the development’ north side, hence this year’s anniversary. As elsewhere in Dublin, building around the square was ‘encouraged’ rather than actually undertaken by its owner. In other European cities the design of new squares and terraces was usually prepared by either a single owner or developer. This means spaces such Queen Square in Bath or Nancy’s sublime Place Stanislas present a uniformity of facades. Such an approach never occurred in Dublin, in part because no landowner was ever sufficiently wealthy, or perhaps confident of commercial success, to embark on such an enterprise. A superb scheme of this kind, for example, was proposed towards the end of the 18th century by the Gardiners for Mountjoy Square but never realised. Instead landlords would sell off individual plots of land on long leases and then require the purchaser to be responsible for the building’s construction subject to certain conditions. Hence even in the 18th century Dublin was rife with speculators and developers many of whom, like their more recent successors, were over-ambitious and ran into financial trouble: the unfinished building site is not a new phenomenon in the city. What gives Merrion Square and its ilk distinctive appeal is the fact that the original builders each took a different approach to their plots; even the size of sites differed, although the majority were for houses of three bays. Notice the variation in roofline height because although the standard was for four storeys over basement, proportions of each floor varied from one property to the next. Then there is the subtle variation in colour of brick depending on its source, and the way in which some but by no means all houses were fronted in granite on the ground floor. Look at the way in which each house has mellowed in a different way from that of its neighbours. Also, since the square was developed over a period of more than thirty years, changes in taste are evident in the proportions of doors and windows, and the inclusion of decorative ironwork, whether a first-floor balcony or an entrance lantern. While the interior was, and still is, private space, the exterior represented a public arena offering opportunities to display wealth and discernment. Never having fallen from favour, Merrion Square survived better than most other parts of 18th century Dublin. All four sides are intact, although rather cluttered with street signage and, at the moment, a daunting quantity of For Sale and To Let notices. The largest extant property is no.45 at the centre of the square’s eastern side. 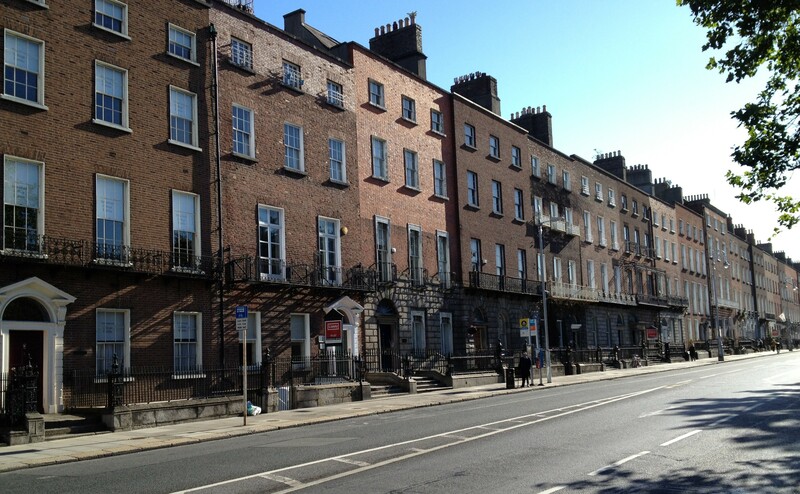 More than 18 metres long and of five bays, it was begun in 1785 by Gustavus Hume, a man who somehow combined a career as a medical surgeon with property development: among his other schemes, he was responsible for laying out Ely Place and Hume Street to the south-west of Merrion Square. Because it was one of the later sections of the square to be built, both inside and out no.45 conforms to neo-classical principles and accordingly is more plainly decorated than some other houses in the immediate environs. Around 1829 the building, by then deemed too big for single occupancy, was divided into two properties and so it remained until ten years ago when restored by the Office of Public Works to its original state. Today no.45 is home to that invaluable resource, the Irish Architectural Archive. 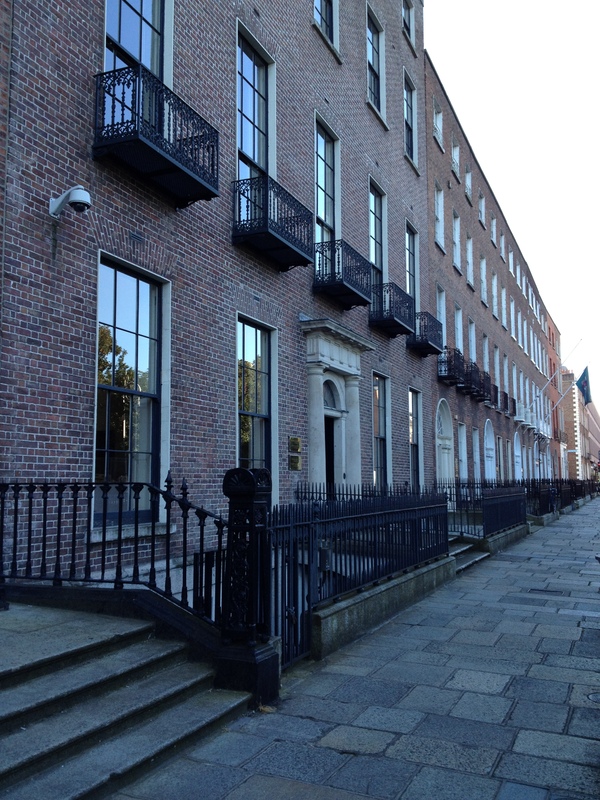 The IAA’s gallery is hosting an exhibition on the history of Merrion Square until 12th October.